Hiring the right digital marketing talent in today’s busy online environment can be a challenge without honing in on the skills and knowledge candidates need to be successful. After all, digital technologies are evolving so fast and the shift to digital marketing for many organizations is still in its infancy. So why not use online resources to source and screen potential hires? Seven out of ten Canadian executives have trouble finding employees with the right skills, according to a recent survey conducted by Environics Research Group. 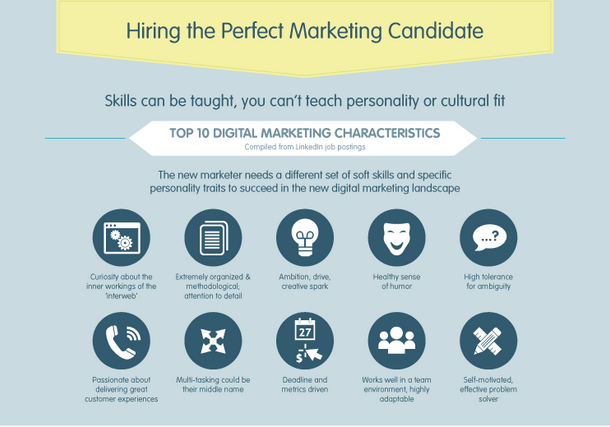 If you are looking to hire or ramp up skills to fill a digital marketing talent gap in your organization there are some specific skills and traits you’ll want to find. Digital marketing is a multi-faceted, dynamic discipline that is constantly in flux with advances in technology, the explosion of online content, emerging interactive communications and an increasingly noisy, competitive market. Having the right digitally-savvy team is sure to increase brand awareness, purchase consideration, and ultimately convert more of your web visitors to qualified leads and customers. Curiosity for continually acquiring new knowledge and skills. Technical aptitude lacking any fear of technology. Business acumen to address measurable business goals and results. Interpersonal, written, and oral communication skills. Time management skills to juggle multiple, parallel, and sequential projects. Self-motivated passion for staying current, innovative, and creative. Organizations should go online to source and screen digital candidates by searching Google for sought after competencies, titles and skills. Then using LinkedIn, Twitter and online forums and other communities. After all, digital-savvy recruits need to be found online and have published credentials. Whether via a social media resume, blog, or social network profile. There is no better field than digital to roll up your sleeves and just do it! Hiring managers will be wise to review candidate’s digital profiles and look for professionalism, consistency, testimonials and references, education and certifications, and examples of projects and web properties the candidate has worked on. Seek out candidates’ blogs to see writing style and coverage of the bloggers’ subject matter expertise and areas of interest. Twitter profiles will reveal how frequently the candidate engages, on what topics they discuss, and who they follow. Look for subject matter that aligns with their digital knowledge and the sources they follow for ongoing discovery learning. One can quickly assess the level of active engagement, working knowledge and reach one has online by visiting and reviewing the candidate’s digital profiles. However, don’t overlook the value of training and certification. Training can make the difference between productive and effective employees with ‘educated competency’ versus learning on the job by ‘trial and error.’ Most marketers don’t have formal digital marketing training with 82 per cent learning on the job, according to Adobe’s Digital Distress survey from September 2013. Completing a specialist degree, continuing education course or certificate, workshop completion or certification demonstrates potential hires’ commitment and investment in the field as well as their ambition. Industry associations IAB Canada and The Canadian Marketing Association offer workshops and courses in digital marketing related topics. Google offers AdWords and Google Analytics certification programs. Several U.S. universities now offer online degree programs in social media and search marketing. The University of Toronto, School of Continuing Studies, offers classroom and online certificates in digital marketing management and digital strategy and communications which require professional learners to complete a minimum of three courses such as digital marketing management, search engine marketing and social media strategy. Michelle (Corsano) Pellettier is a digital marketing coach and enabler, and senior marketing strategist. Her specialty is technology marketing and using technology to market. Michelle teaches Digital Marketing Management at The University of Toronto, School of Continuing Studies. Burst Technology Marketing helps organizations grow their business and advance purchase consideration by engaging customers through digital communications and converting web visitors to leads.